In the not too distant future, an oleaginous Hollywood exec decides he can dispense with the "difficult" Hollywood acting talent, by using you her looking versions of digitised actors. He'll pay them to stay in IRL retirement and sVe them from their own bad choices. Twenty years later, he now has proof of concept, and can dispense even with the digitisers and animators. Consumers will now hallucinate the fantasy movie character and life they want to leave. Is this the total consumer right to choose? Or has the studio gone from manipulating actors to manipulating everyone? Director Ari Folman's mind-blowing movie THE CONGRESS, based on the Stanislaw Lem novel explores these issues and so many more. It's a bitter satire on rapacious Hollywood execs and the cult of youth; an exploration of the concepts of personal identity and free choice in a digitised world; and at its most scabrous, a personal attack on Tom Cruise. At the same time, it's a love story: the story of a mother trying to hold on to reality so that she can care for her ill son. 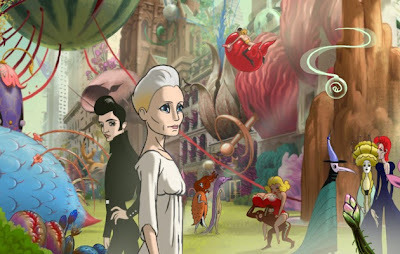 The star in question is a virtual reality version of Robin Wright, and in the first hour of the film we see her in live action, struggling with irrelevance in contemporary Hollywood. She loves with her bright daughter Sarah, who embraces the concept of digitisation and her wonderfully imaginative son, who we learn has a degenerative illness. But berated and harangued and manipulated by her agent (Harvey Keitel) and her studio boss (Jack Huston), "Robin Wright" takes the contract. In the second hour of film we fast forward twenty and then forty years as the actress, now released from her initial contract, attends the Futurologist's Congress of the title, and sees the newly hallucinogenic, animated world where anyone can pop an ampoule and become Marilyn Monroe, or indeed, the newly successful franchise-heroine Rebel Robin Wright. I loved the satire on Hollywood and the sheer technical feat and imagination involved in putting this film together. But I couldn't help but think that a lot of the ideas on show were derivative of THE MATRIX and THE PLAYER and WAG THE DOG and AI and...... And as for the storytelling, it needed serious pruning. We coulda cut thirty minutes from the opening love action here and about twenty minutes from the animated interlude. Worst of all, although Ari Folman tried to give the movie some heart by giving Robin Wright a mission to get back to her son (Kodi Smit-McPhee) I just couldn't get invested in that story at all. So, all in all, a rather derivative film lacking in heart underneath all that technical wizardry. THE CONGRESS has a running time of 122 minutes. THE CONGRESS played Cannes and London 2013. It opened earlier this year in France, Belgium, Germany and Poland. It opens in the Netherlands on January 9th 2014.